Are you looking for Bengali Current Affairs PDF? Then, here is the best place for you.GK Solve Solution your Problem. Current Affairs is the most important subject for any kind of Competitive Exam. Most of the Bengal Students want to read Current Affairs in the Bengali language. 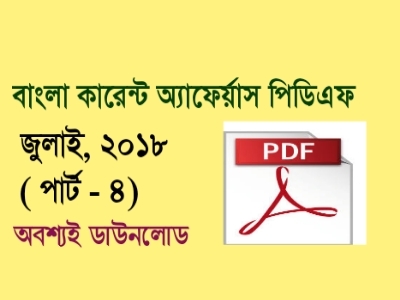 Today GK Solve share Bengali Current Affairs July 2018 4th week pdf download link. Details of the PDF book and download link are given below. You should download this Bengali Current Affairs pdf book. Hope, this materials is very useful to you.